The other day I was looking for some new materials and ended up on myspace. Let me tell you, that place has lots of Hebrew Tattoo pictures... the vast majority of them incorrect. Today's feature is one of my new finds, and it also features an error we've seen before. Give some applause to God of the Sea! This guy was keeping it simple, all he wanted was a single word "God". Unfortunately, somehow an extra space found its way into the tattoo, turning "Elohim" into "El Hayam" - God of the Sea. How can a word like "God" be cut in half and still retain it's meaning you ask? See, the original word "Elohim" means God, it's in a special multiple form to emphasize God's greatness. When it's spelled this way, you have no doubt which god is meant, it's the biblical God and no other. Cut the frills away, and you're left with "El", aka god, no emphasis or capitalization needed. It can be used to refer to any god you like. Conveniently, the other part of the word transforms him into God of the Sea. You can write it in two ways. The one on top is what the featured tattoo was supposed to look like. People not practiced in Hebrew might not see the difference, but even spacing is crucial. The bottom version is the one more common in modern Hebrew, I prefer to write God this way. The difference between the two is the letter Vav, which reads here as the "O" in "Elohim". In this case it's an optional letter, you can choose whether to write it or not. 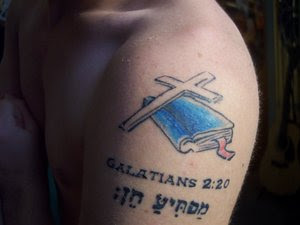 Can a guy just wake up one morning, decide he wants a nifty tattoo, randomly ink on some cool looking Hebrew characters and hope no one would be the wiser? Or is it a scenario of drinking and inking? In any case, it might be signed "Psalm 19:14", but I can assure you, it's not about this verse or any other. Totally random letters decorated by even more random nikkud (vowels). I can only shake my head at it. The piece below is terribly spiritual. It's meant to say "Surprising Grace" in Hebrew, referring to the sacrifice of Jesus... You know, the usual stuff. And as usually happens, it went wrong. The tattoo above actually says "Charm Surprising". I always warn against plugging a sentence into online translators and inking it on as is, since the above result is pretty much guaranteed. 1. The words are in reversed order. See, in Hebrew grammar you put the noun (Grace) before the adjective which describes it (Surprising). 2. The word "Grace" holds many meanings in English. In Hebrew, however, the meanings are separated. The word "Grace" used in the tattoo is "Chen", its meanings are charm, attractiveness, elegance. It is also a popular female (and sometimes male) name. Nothing divine about it. The word for "Grace" you'd want to use in a spiritual context, is "Chesed" which holds the meanings: kindness, charity, favor. My Love? My Joy? My Linguist? This tramp stamp isn't all that bad really. It says "Gili" which in Hebrew means "My Joy". This piece is only featured here because the owner disagrees with its meaning. 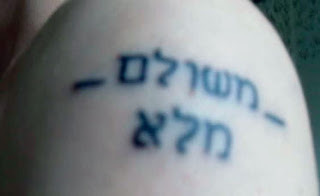 The woman claims her tattoo says "My Beloved", and when a well meaning commenter told her otherwise she claimed a "Hebrew linguistics professor" translated it for her. So listen up, this is a new advice for the tattoo wannagets, don't get your Hebrew translation from linguistics professors, especially when they're drunk (or don't know any Hebrew)! The top word is"Gili", meaning "My Joy". It isn't gender specific. The middle word is "Dodi", meaning "My Beloved" in old Hebrew. It's a male form. The bottom word is "Ahuvi", which means "My Beloved" in modern Hebrew. It's a male form. Notice that both forms of beloved, talk about a male beloved, so they should be tattooed on a girl (or a gay boy). The tattoo says "Faith" in Hebrew, or at least attempts to. It is in fact written backwards. So, is a backwards faith still faith, or would it mean the opposite of faith on the spiritual level? You know, like Satanists who use inverted crosses as their symbol? Want Hebrew "Faith" of your own? How about a T-Shirt? I kid you not, this is what it literally says, fused words and all. 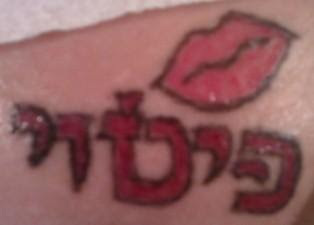 So yeah, getting your Hebrew tattoo in Korea - FAIL! Sad, sad things happen when one tries to translate an expression from one language to another by plugging it into an online translator, as suspected (by yours truly) in this case. It is supposed to say "Paid in Full" in Hebrew, you know, the usual christian drivel about Jesus paying for his sins? Anyway, it does say "Paid", and it does say "Full", but the combination does not mean "Paid in Full" at all. The best translation for the above ink is "Lots is Being Paid". For today's Hebrew lesson we'll learn how to write "Paid in Full" correctly. After all, it's important to get your wording just right the next time you need to issue a receipt to Jesus.